"A spicy chicken dish that's easy to make yet very satisfying. Served over rice." Heat the oil in a skillet over medium heat, and cook the chicken strips 10 minutes, or until browned and juices run clear. In a saucepan over medium-low heat, mix the black beans, diced tomatoes, green beans, Creole seasoning, and chili powder. Cook, stirring occasionally, until heated through. Mix the chicken into the bean and tomato mixture, and continue cooking 5 minutes. Serve over the rice. This recipe was very good. 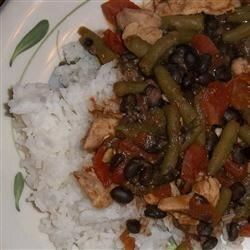 I was a little doubtful when I put in the green beans, but they tasted great. Corn would work too. My husband and I both liked it. No leftovers with this one. Easy & quick. Added corn for color and used brown rice.